Congratulations to Deborah Allmand for winning THE PLAYER KING from last week's blog post. 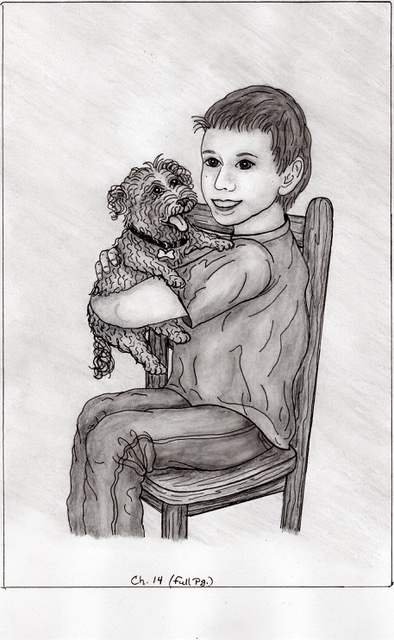 My blog readers know that I generally read and review books for children and teens. Every once in awhile I come across a book for adults that I want to share with you. 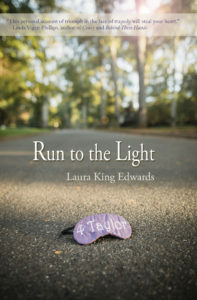 Run to the Light (Bedazzled Ink, 2018) by Laura King Edwards is one of those. But first a disclaimer: Laura Kings Edwards' book about her sister Taylor's battle against Batten Disease is not an easy book to read. Batten, a rare inherited neurological condition that causes vision loss, progressive cognitive and motor decline, and seizures, usually strikes children between the ages of 5-10 and is always fatal. Laura does not hold back on describing her fear, anger, depression, and anguish during the twelve years that Taylor bravely fought the Batten monster. But she also eloquently shares the joy she experienced in the moments she shared with her brave little sister. If you've been reading my blog long enough, you will recognize this story. Laura gave me the privilege of hosting her cover reveal on my blog last March. Now, you'll hear about the story. Read it, and be inspired. Read the story behind this cover here. In 2006 Taylor was not quite eight when her family realized that her vision and school problems signified something far worse than any of them imagined--they were Taylor's first symptoms of Batten Disease. In evocative detail, Laura shows the reader the disease's progression, how it impacted Taylor and her family, Laura's journey to find acceptance, and most of all--how Taylor became a symbol of courage to her Charlotte, NC community and to the Batten world at large. Throughout the progression of the disease Taylor never asked, "Why me?" "Even as her body started failing her, she sought a normal life and never asked for extra help or attention." (p. 26) Taylor's resilience amazed Laura more than anything else. 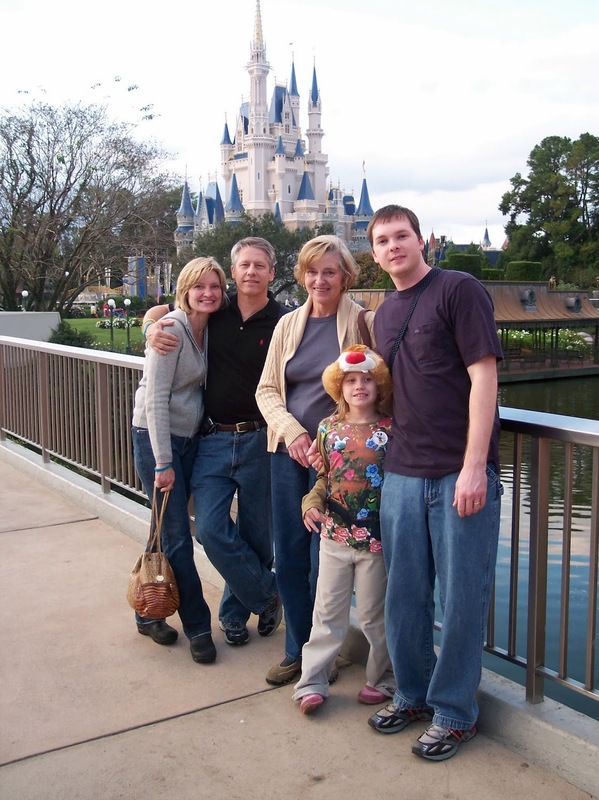 Although there were the common stages of denial and numbness that we all experience when we receive shocking news, the King family--particularly Laura and her mother Sharon, turned their anger towards fighting the disease. Several months after the diagnosis, Sharon invited a small group of women to come for lunch. Laura listened as Sharon "declared war on Batten disease and urged the rest of us to join her on the battlefield." "The doctors said there's nothing we can do," she said. "But I'm not going down without a fight." Her voice cracked as she described our opponent, ticking off the symptoms that had crept into my sister's life and the awful ones yet to come. But her resolved never wavered. "Nothing about this will be easy. There's little being done for Batten disease. There aren't many kids like Taylor. But we have to start somewhere. Someone has to take a stand." Sharon's decision to fight Batten led to taking Taylor cross-country to participate in a clinical trail to receive purified neural stem cells at Oregon Health and Science University in Portland. It led to raising thousands of dollars for research, attending umpteen Batten disease conferences, and learning the foreign language of medicine and science. It even led to a new North Carolina law that established the first rare disease advisory council in the country. 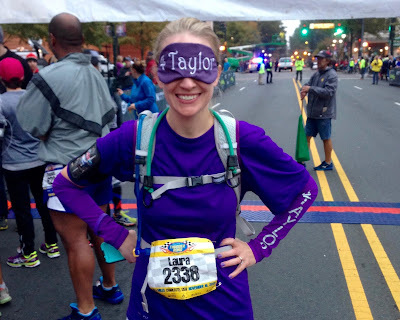 Two years later Taylor inspired Laura by running a 5K-- the only blind person in the race. Taylor ran tethered to her running buddy by a bungee cord. 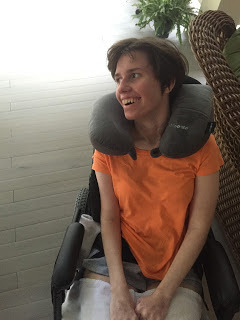 Whereas I'd often felt only anger toward Batten disease, my sister had beaten her demons by ignoring them--by focusing not on what she'd lost, but on what she could still do. She didn't waste her time worrying about what Batten disease had taken from her. She paid it no mind, and she ran her race. I'd come to understand the value of a long-term plan. I'd learned how to push my body past the limits of what I'd previously believed it could achieve. the U.S. Virgin Islands, 2010. 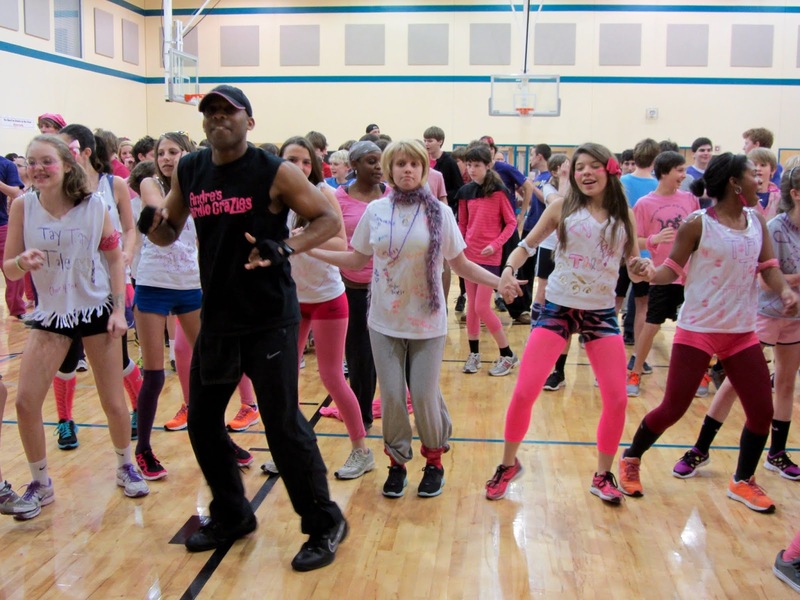 Taylor's Fletcher School classmates raised $3500 for Taylor's Tale in 2013. Taylor is third from the right. The last race that Laura describes in the book is the one she ran blind--just like Taylor did. She trained for five months and used the same bungee cord that Taylor had used several years prior. She was cheered on by other runners, the media, and her family. I'd run 13.1 miles in the dark But I didn't take a single step alone. As I ran the final stretch of Thunder Road, led by the voice of a friend and the courage of a dying girl, I understood: Batten disease may have cast a dark shadow on our world, but I wasn't running away any longer. I was running to the light. "Together with other dedicated advocates, Taylor’s Tale is uniting elected officials, healthcare providers, public health officials, researchers, biotech industry representatives and patient advocates. This important work is creating real, lasting progress in the development of breakthrough treatments and life-changing legislation for rare disease patients." Also, Linda Phillips most recent YA novel in verse, Behind These Hands, is a story of a young girl struggling with the fact that her two siblings are diagnosed with Batten. It is based loosely on a family in Charlotte. This giveaway began in March with Laura's cover reveal. Add your name to that list by January 3 and you'll be in the drawing also. This time you have an extra chance to win since both Laura and I are giving away a copy. Please leave me your email address if you are new to my blog. 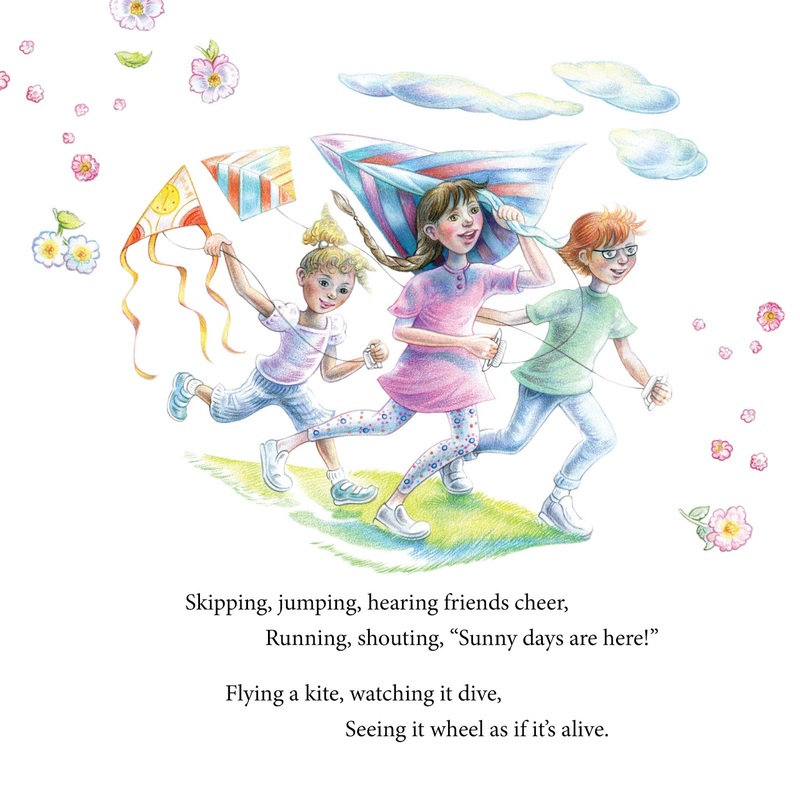 Congratulations to Kathy Dykstra, an “old” friend who is new to my blog, for winning Four Seasons of Fun and to Connie Saunders for winning Lulu & Rocky in Milwaukee. I was already an Avi fan when I had the privilege of hearing him speak at the South Carolina Reading Association. I’ll never forget his guessing game for his audience. He asked us how many times we thought he revised a novel. I don’t think anyone came close to the answer: 100 times! 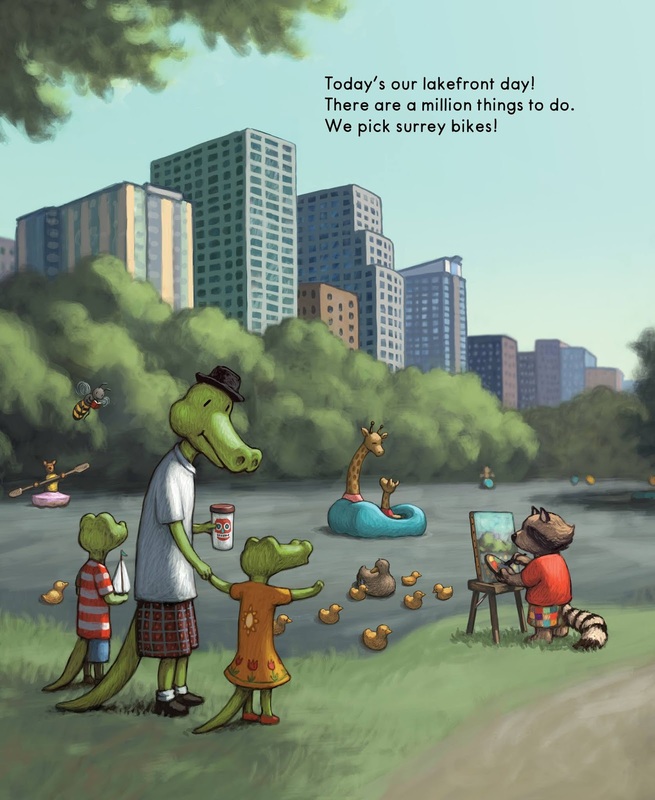 His books demonstrate his driving desire to "get it right" results in well-crafted books for children which adults enjoy too. England, 1486. King Henry VII has recently snatched the English Crown and now sits on the throne, while young Prince Edward, who has a truer claim, has apparently disappeared. Meanwhile, a penniless kitchen boy named Lambert Simnel is slaving away at a tavern in Oxford—until a mysterious friar, Brother Simonds, buys Lambert from the tavern keeper and whisks him away in the dead of night. But this is nothing compared to the secret that the friar reveals: You, Lambert, are actually Prince Edward, the true King of England! "If you act like a king, you will be king." Brother Simonds drills this advice into Lambert every waking moment. This motto dictates how he must bathe, wear shoes, memorize his royal lineage, and act like nobility during during an audience with the Earl of Lincoln. Although Lambert's belly is full for the first time in his life, he longs to return to his simple life as an enslaved kitchen boy--to hear once again that he is a "nobody." But when he runs back there, believing that Simonds must be mad to think he is the rightful king, he finds that no one recognizes him with his trimmed hair and elegant clothes. 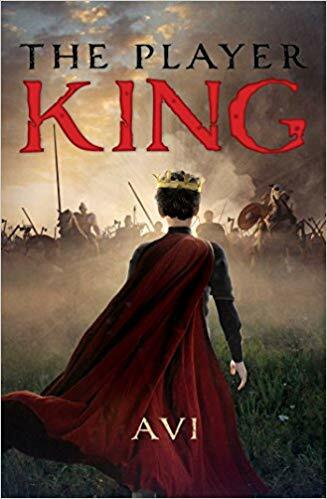 The second time Lambert escapes the guarded house where he is being trained to assume his role, he sees a "player king," a man who acting the part of a king in a play in the marketplace. Lambert realizes that he has the unique opportunity which every boy in England dreams of--he could actually be the King of England. Although he recognizes that Brother Simonds and the Earl of Lambert are using him for their own political gains, he begins to believe, "I am Edward. Earl of Warwick. I am the true king." But it is clear to the reader that he is a boy enjoying a grand adventure. Lambert gets more than he bargains for. He mocks Simonds who leaves him and Lambert belatedly realizes that the priest was his only friend. With allusion to "The Emperor and His New Clothes" and My Fair Lady, Earl of Lincoln and his advisor, Lowell, condescend to calling Lambert their king. But as Lowell pointedly says, "It is always better when the storyteller believes his own tale." Read the histories of the time, and he [Lambert] is barely mentioned. Indeed, just last week I saw a documentary about Henry VII and Lambert was not even cited. But Lambert—a boy—was crowned King of England (in Dublin, Ireland) and led a large invasion army into England, only to be defeated at the Battle Of Trent, the last battle of the War of the Roses. I noticed Lambert in a footnote. Very little is known about Lambert Simnel. Where did he come from? How did he come to be crowned king? What happened to him after the battle? Certain facts are known—he did exist—but the boy…. Just who was he? What did he think of all that happened to him? That’s what I have tried to write in The Player King. Strictly speaking, the title should have been The Player Kings. There is more than one false king in the book. The challenge was to write about something which is well known—except the central player, the player king—the boy known as Lambert Simnel. The truth is, foot notes are the foot soldiers of history. Here is an audio excerpt from the book. I'm able to give this book away courtesy of Recorded Books. John Keating does an excellent job as narrator. It will make a great middle grade curriculum resource; teachers could discuss English history and political maneuvering throughout the ages. If you are interested in joining this giveaway, please leave me a comment (with your email address if you are new to my blog) by December 29th. Share this on social media or start following my blog and I'll enter your name twice. This is my fourth book to give away in time to mail before the holidays. I may squeeze in another review next week--but no guarantees. If you don't hear from me for a little while it's because I'm taking a break. But no worries--I'll be back in your inbox with more reviews, updates on Half-Truths, and writing tips next year. Some of you wonder how I'm able to give away so many books. I'm fortunate to regularly receive picture books from Sleeping Bear Press as well as audio books through Tantor Audio and Recorded Books. Other books I read about on social media and I approach the publisher for a review copy. Occasionally, authors approach me to do a cover reveal and I try to accompany that with a book review and giveaway. It's a win-win situation for all of us. I get to read a ton of books and share them with you! 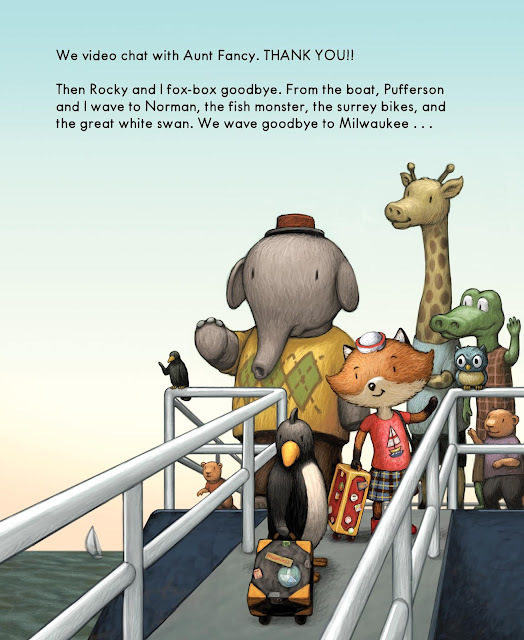 Study the magnificent cover of this new picture book from Sleeping Bear Press. 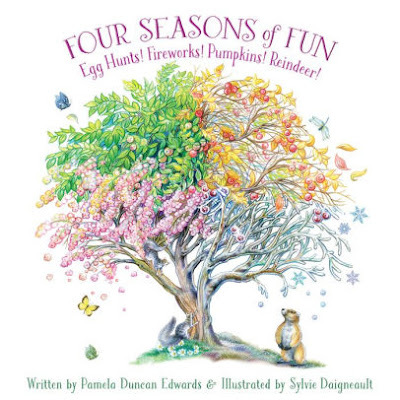 Purchase it for a young reader and the two of you can search for this tree through the poems about the changing seasons by Pamela Duncan Edwards. 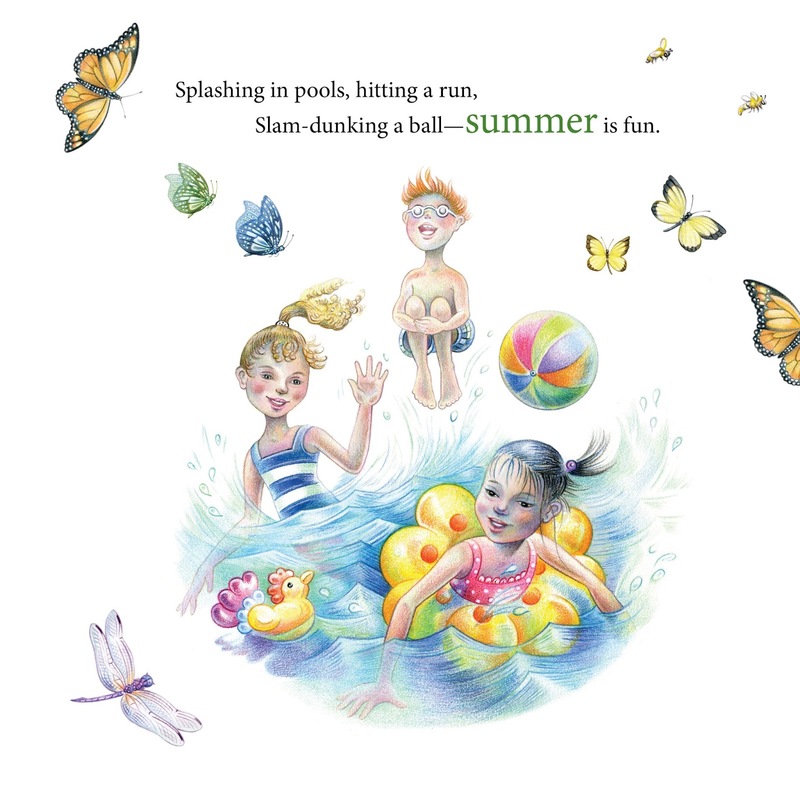 Illustrated by Sylvie Daigneault, Four Seasons of Fun will be a pleasure to read aloud and share with your favorite little reader. Kudos to art director, Felicia Mascheke for the concept of the changing tree for each season. for a tree that is wearing a blossom gown. groundhog has finished his winter sleep. The summer tree is growing fruit! the tree stands tall, a royal queen. beaks reaching up for a tasty bug. 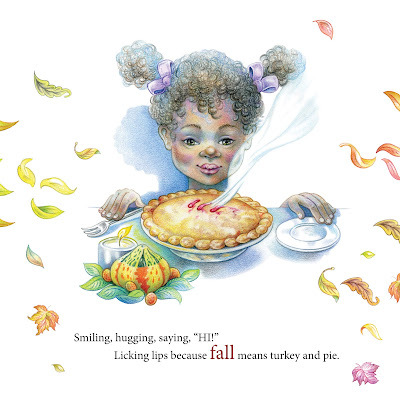 The fall tree is ready to be picked; its fruit finds a home inside a pie. Even the bare tree of winter is spectacular in its coating of ice. and sniffs at the air. 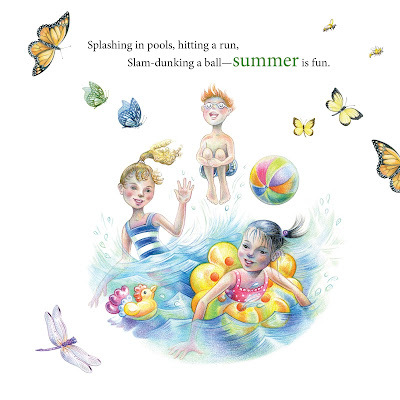 The book shows diverse characters enjoying different seasonal activities. I love the imagery in Pamela Duncan Edwards' poetry and the accompanying illustrations by Sylvie Daigneault. The ending is just right--as the seasons begin all over. I can picture a K-first grade teacher using this in a classroom discussion about the seasons. Leave me a comment by December 17 along with your email address if you are new to my blog. For an extra chance, either follow my blog or refer a friend who decides to follow it. (Both you and your friend will be entered twice; make sure you both leave comments and indicate this.) USA addresses only. 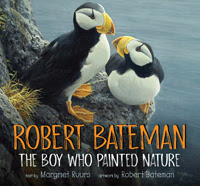 Congratulations to Jo Lynn Worden who won Robert Bateman: The Boy Who Painted Nature and to Linda Phillips who won The Elephant Whisperer. Both grandmothers plan to share these books with their grandchildren. I love it! 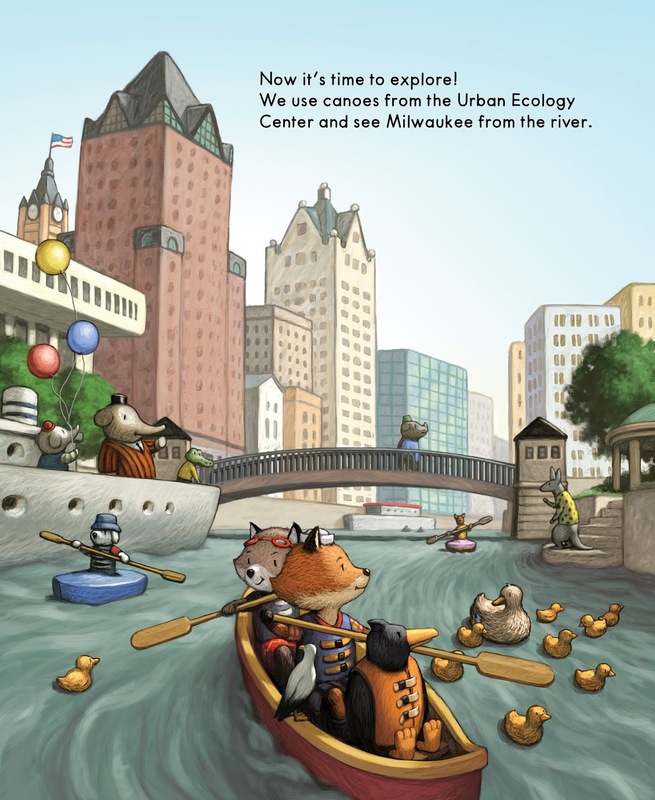 With the publication of Lulu and Rocky in MILWAUKEE, Sleeping Bear Press introduces a new series of books, Our City Adventures. 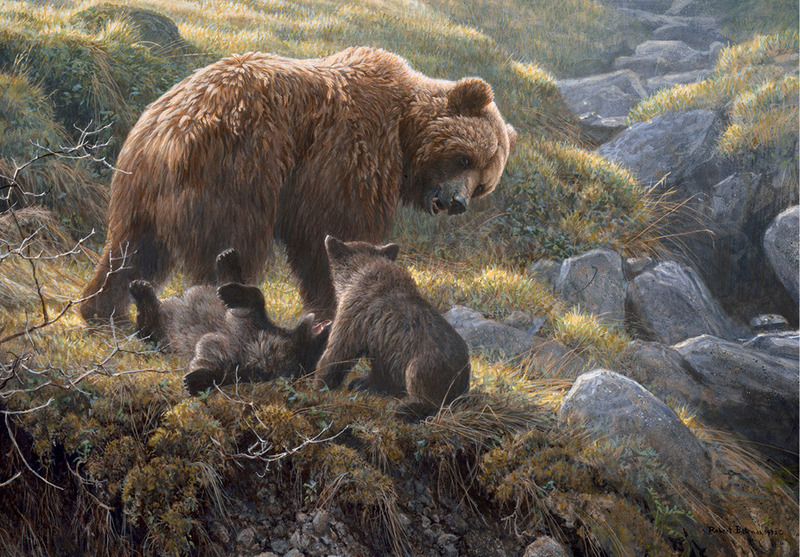 (Click here for Sleeping Bear Press comprehensive catalog). 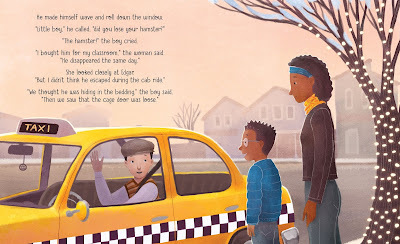 Author Barbara Joosse and illustrator Renee Graef will be featuring Detroit in their next book in the series. 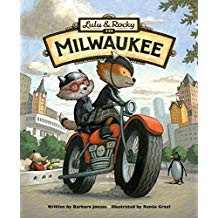 In this entertaining travel guide for kids, Lulu and her cousin Rocky explore the city of Milwaukee. Their adventure begins with a ferry trip across Lake Michigan and then settling into the historic Pfister Hotel. After working up an appetite, they eat fried cheese curds in the Historic Third Ward. They take selfies at the Bronze Fonz, visit the North Point Lighthouse and Discovery World, and for dinner they visit the Lakefront Brewery. Although they're not shown drinking in the illustration, this might be a questionable location to include in a picture book for young children. Along those lines, Pufferson, Lulu's penguin companion, is pictured drinking beer at lunch. The next day they're busy exploring the lakefront. 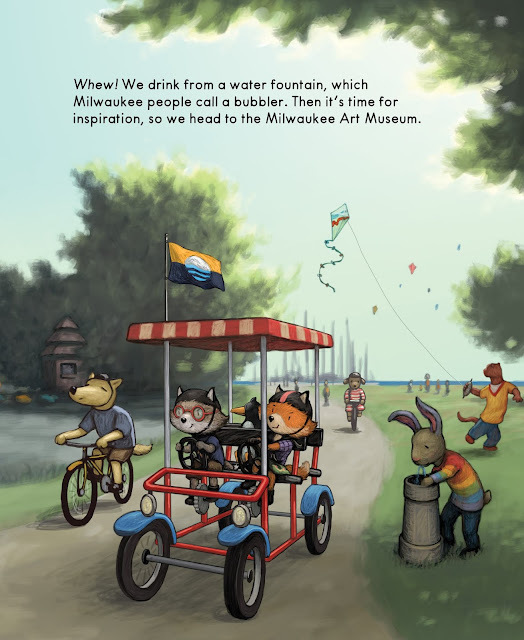 The pair are inspired at the Milwaukee Art Museum and see a brise soleil on the roof that inspires Lulu's painting of herself riding in the clouds. 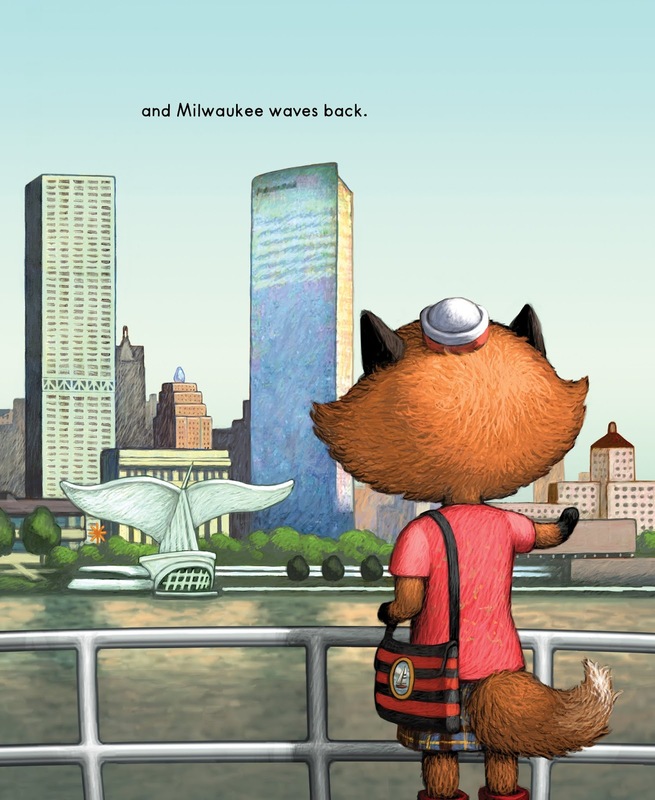 At the end of their trip they wave to Milwaukee. The book concludes with a list of places that were included in the book and other places to visit. The series sounds like they'll be great books to use as a K-2nd grade resource. Leave me a comment by December 17 if you would like to be entered in this giveaway. This would make a nice present for the midwesterner in your life! As usual, please leave your email address if you are new to my blog and US addresses only. Every so often I page through Tantor Audio's catalog and come across a title that sounds intriguing. 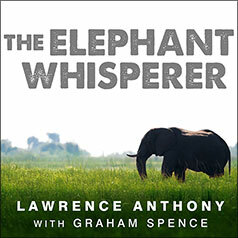 That's what happened when I read the description of The Elephant Whisperer (April, 2009 PanMacmillan) by conservationist Lawrence Anthony along with journalist Graham Spence. The book comes alive through the British narration of BBC broadcaster Simon Vance. One of the opening lines that captured my attention was when Anthony wrote, "Elephants taught me how to listen." 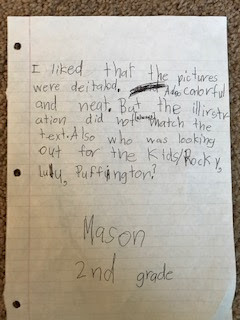 As the narrative unfolds, the reader discovers that his herd of rogue elephants also taught him about trust, loyalty, respect, and freedom. 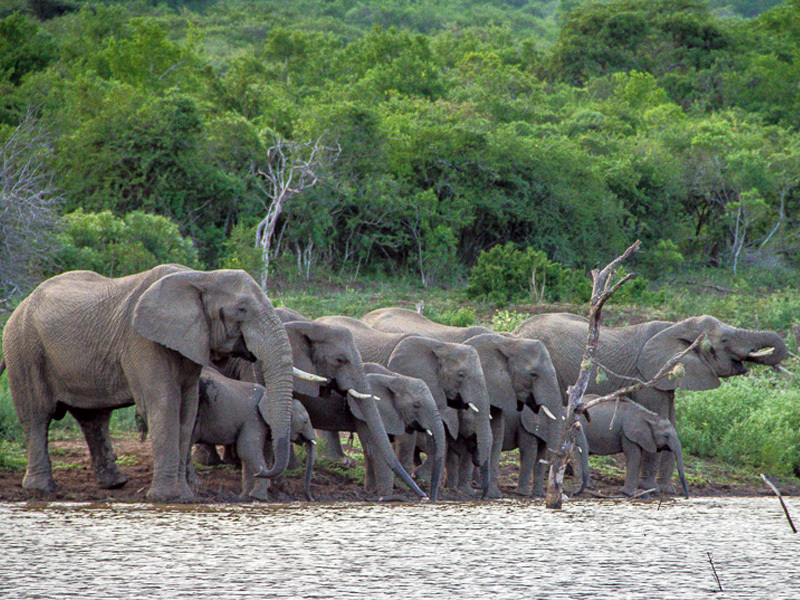 South African Lawrence Anthony's game reserve, Thula Thula, is in the heart of Zululand. He started it in 1998 with 1500 hectare, and was committed to returning the area to its original state. When he was asked if he would receive seven elephants hostile in their interactions with humans, he couldn't refuse. This was the first of many difficult choices he faced: if he didn't take them, they would be killed. The first herd arrived in 1999. 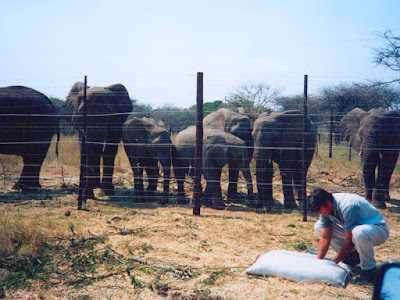 Contrary to popular opinion which dictated that wild elephants should have no contact with humans when brought into a new home, Anthony decided he needed to let these traumatized "magnificent" animals (his favorite descriptor) get to know him. While they were in quarantine he spend night and day outside the fence talking to them and letting them get used to him. He named them and used their names in conversation. The day that the matriarch, Nana, reached her trunk towards him, he stood still while she sniffed him. The next day he released them into the preserve. The book is full of Anthony's challenges. The herd figured out how to break through the electric fences and head back home. Anthony spent time and money to bring them back--knowing that the alternative was for them to be killed. Poachers (who turned out to be his own guards) killed over one hundred animals and obtained thousands of pounds of meat worth thousands of dollars. Three white rhinos were introduced into the preserve; keeping the elephants away from them was a huge task. One time he was pedaling a bike with his fiancé, Francois, alongside of him. They accidentally ended up in the middle of the herd. Being up against seven huge animals who were unfamiliar with the bicycle and Francois put the pair in serious danger. Meanwhile, Anthony spent hundreds of hours with the herd gaining their trust. One night he opened the door of the lodge to see Nana practically inside. She snaked her trunk through his bedroom window and although she could easily have picked him up and done whatever she wanted with him, Anthony stood firm and let her sniff him. Later Francois recommended a bath-- Anthony was covered in half a pint of elephant slime. The main house which Nana decided to visit. Anthony developed an uncanny ability to sense when the herd was near. He felt as if the elephants could project their presence into the area. If they didn't want to be found, they wouldn't be. He could sense their deep rumblings in the bush even if he couldn't hear them. "The elephants determined the emotional feelings of the encounter, not me." Similarly, the elephants set the boundaries, not Anthony. Mostly he sat and waited for them to feel comfortable before moving closer to them. 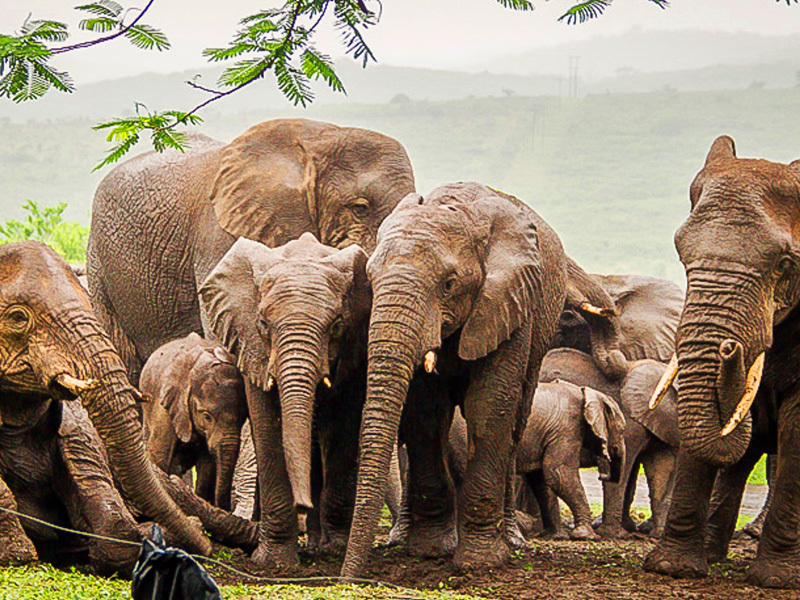 When Anthony was gone for a week, there would be a welcoming committee of seven elephants waiting when he returned. When a fire broke out on the reserve, the elephants led humans and other animals to the Crock Pool to wait until the fire burned itself out. In 2004 Anthony and his team of rangers rescued a baby elephant who was born with deformed feet. He and Francois cared for him in their guest bedroom. 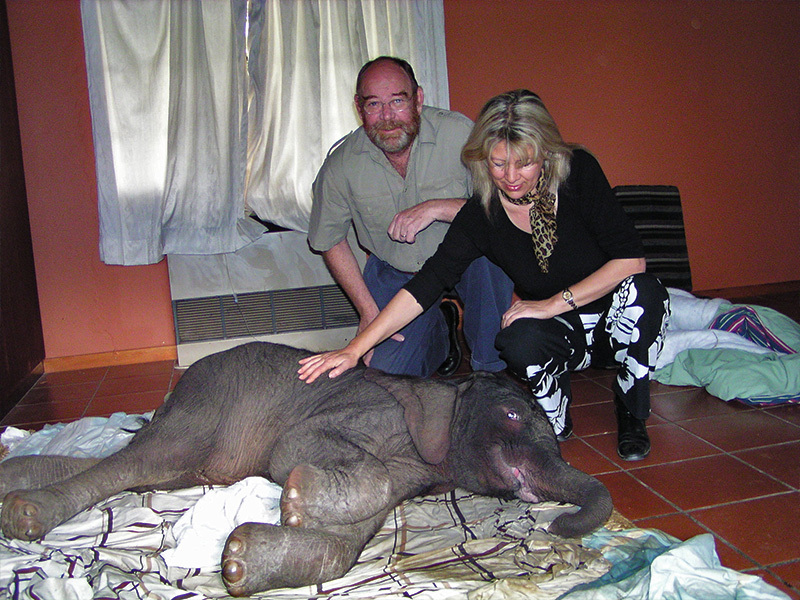 Despite bottle feeding and intensive medical care, baby Thula died and the entire staff was heart-broken. Anthony noted that Nana communicated with her eyes, trunk rumblings, and subtle body movements. One day he walked out to her and she walked towards him and he had no escape route. Her legs--as big as tree trunks--could crush him. But the moment he spoke to her she relaxed and so did he. "Communication is a two-way street--whether it's a person or an animal. You have to acknowledge that the communication has reached you. Or, it's all over." By the time Anthony died in 2012, the herd numbered thirty elephants. For three consecutive years the herd returned to the house on the day of his death to mourn him. 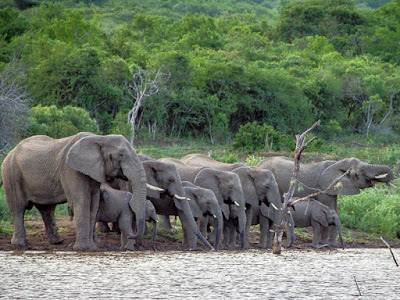 In 2008 and then again in 2010, Thula Thula partnered with adjoining lands and increased in size by another 2300 hectare. The Elephant Whisperer, which will be enjoyed by children and adults, ends with a plea for conservation. 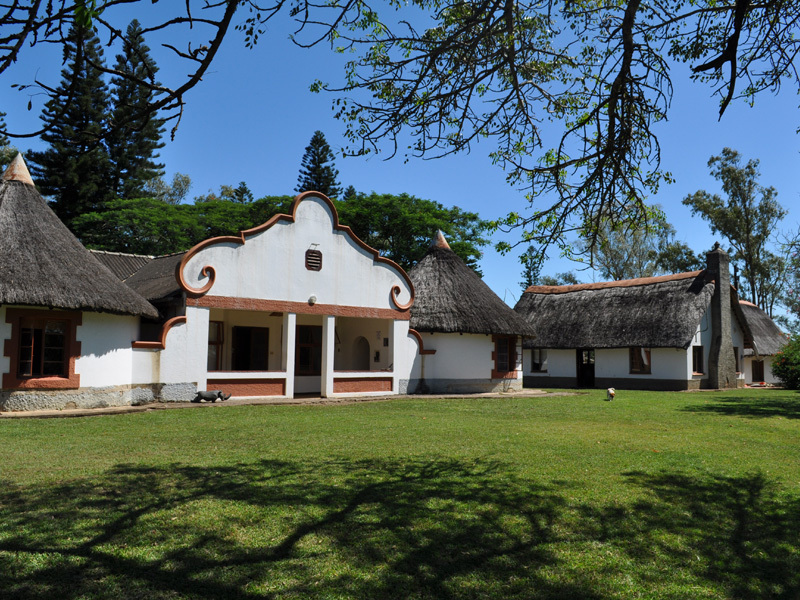 For more information about the reserve--including staying there and participating in bush excursions, please see Thula Thula's website. (All pictures are from the website.) Here's an audio clip so you can hear Simon Vance's terrific narration. To enter this giveaway, please leave me a comment by 9 PM on December 12. Remember--leave me your email address if you are new to my blog. This is a great present for the animal lover on your gift list! Congratulations to Clara Gillow Clark who won Finding Home: My Arc-O-Biography on last week's blog. Note: In the next two weeks I'm going to try and post extra book giveaways so you have a chance to win a holiday gift for someone special. When I saw on Margriet Ruurs Facebook page that she had a new book coming out, I knew I wanted to share it with all of you. 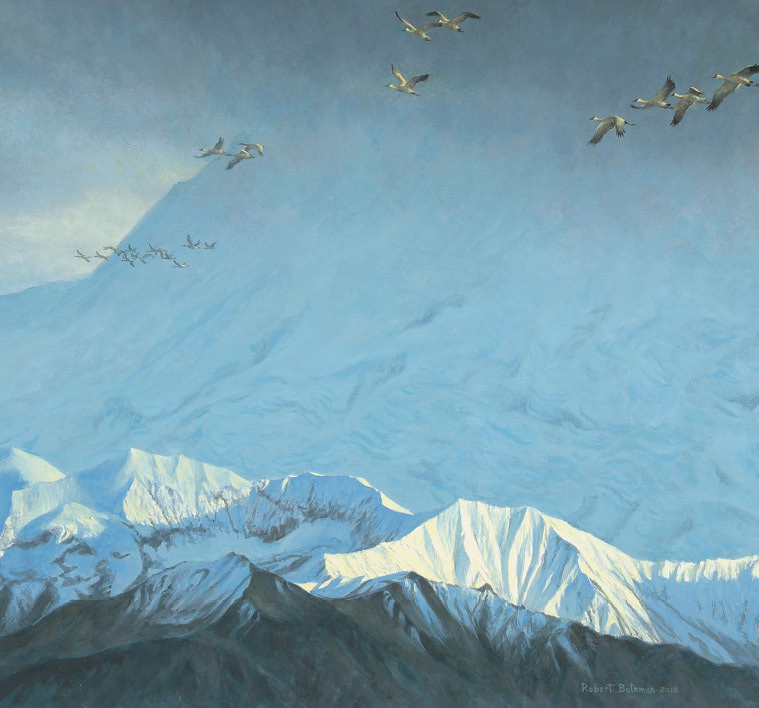 Robert Bateman: The Boy Who Painted Nature, (Orca Books, 2018) is a wonderful tribute to one of Canada's most famous artists. 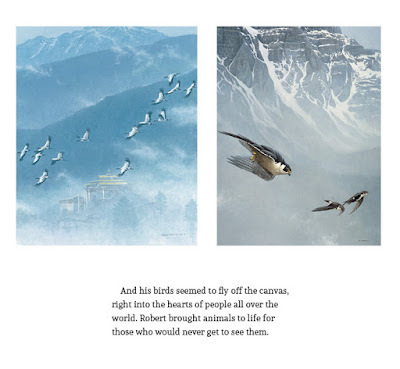 Both the text and illustrations are beautiful; I had a hard time selecting which illustrations to accompany this blog. 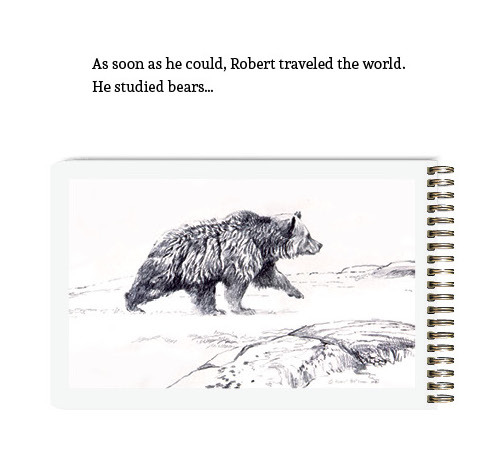 Hopefully the pictures and short snippets of text will pique your interest; the animals I've named in the review are accompanied by magnificent illustrations. From a youth, Mr. Bateman loved the outdoors and was "in awe of nature." 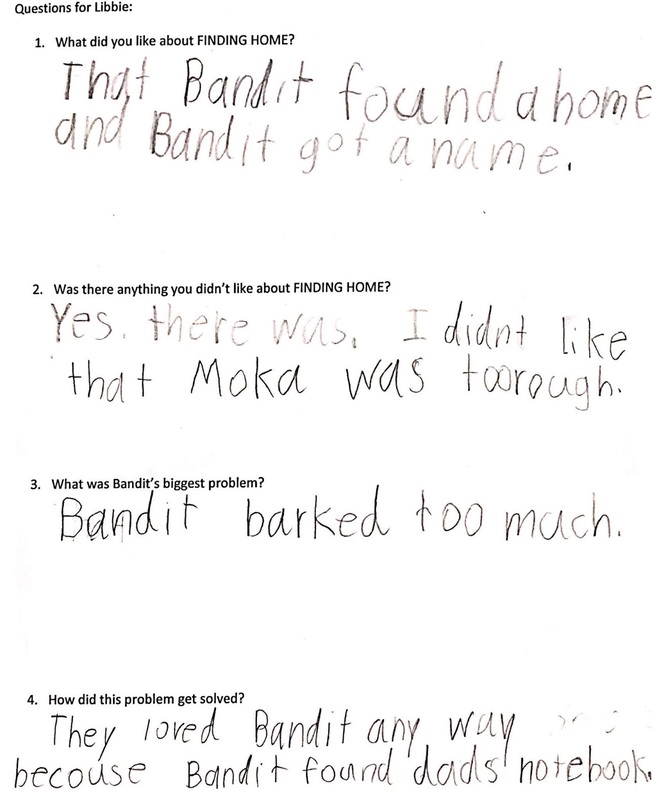 He investigated fields and animals; birds and plants. "In school he spent a lot of time staring out the window. He dreamed of traveling so he could see more wildlife, from whales to wrens." Not only did Mr. Bateman "paint the shapes and patterns of the world around him," but he also carved wooden birds and noticed "details of feathers and form." Owls, penguins, polar bears, and lions in their habitats. Now Robert walks the forest with his grandchildren. He shows them the shape of a leaf, the texture of bark. He tells them to pay attention to the details of nature around them. Robert Bateman: The Boy Who Painted Nature will be enjoyed by grandparents, parents, K-3 teachers, and of course--young readers themselves. Hopefully the text and illustrations will encourage our next generation to appreciate nature as Mr. Bateman did as a child. Leave me a comment by December 12 with your email address if you are new to my blog. For an extra chance to win, share this on social media (please let me know what you did) and I'll put your name in the hat twice. Finding Home: My Arf-O-Biography: A Grandmother/Granddaughter Review + Giveaway! 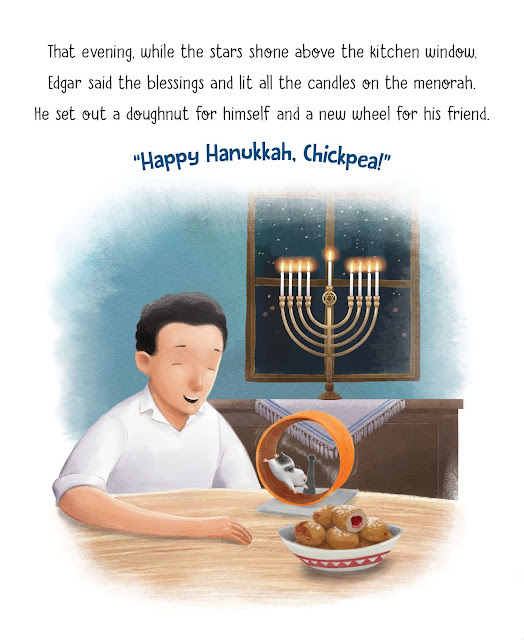 Congratulations to Clara Gillow Clark for winning Hanukkah Hamster from last week's blog. Clara is a fellow writer and blogger with whom I often trade books! In this post, I'm introducing a new format for some of my book reviews. I'm known to five of my six grandchildren as the grandma who loves books. (The sixth is only 3 months old. Give him time.) When I read this book I knew it would be a perfect read for my seven-year-old granddaughter, Libbie, who not only loves dogs, but has wanted to be a veterinarian since she could say the word. She agreed to read the book and give you her thoughts. 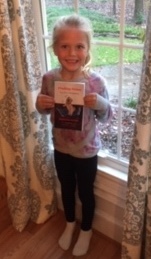 So here you go, friends--a book review brought to you by Libbie and me! This sweet early chapter book is perfect for the 1-2nd grade reader who is starting to read on her own. 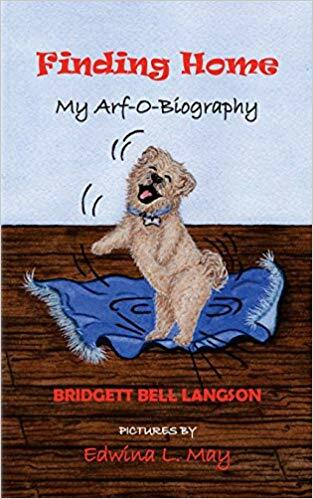 This is Bridgett Langson's debut book and her love for all things four-legged and fuzzy comes through loud and clear. 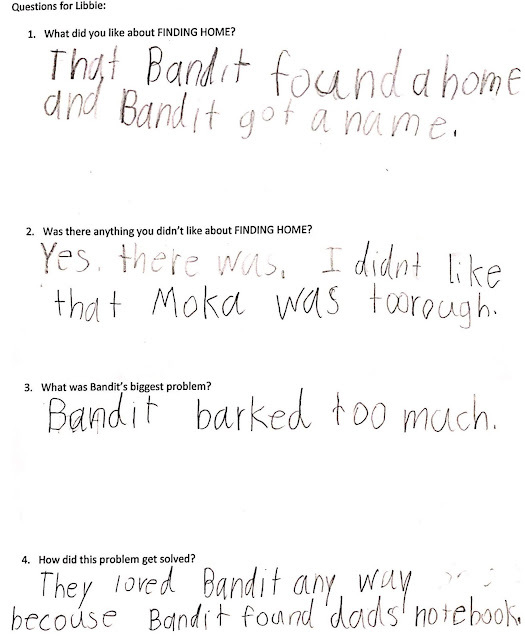 Like Christie Miller's book, Raccoon Rescue, FINDING HOME is written for young readers from the point-of-view of the animal character, involves a rescue, and is self-published. Eric's father dislikes his yapping and is not convinced he wants to add another dog to the household. Puppy has a keen sense of smell, and can smell when a person is scared. 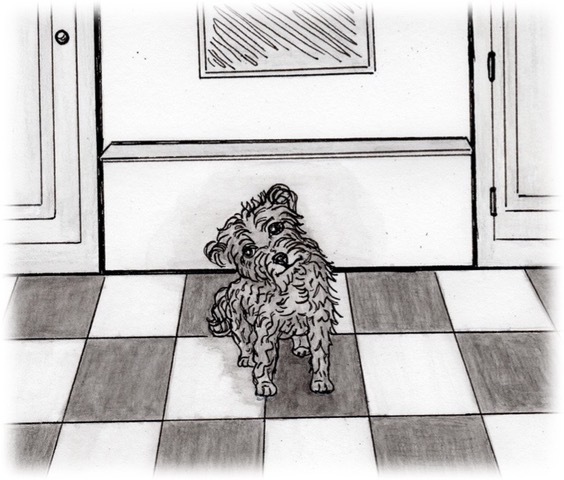 This sense of smell saves the day when Puppy finds Eric's father lost work notebook. 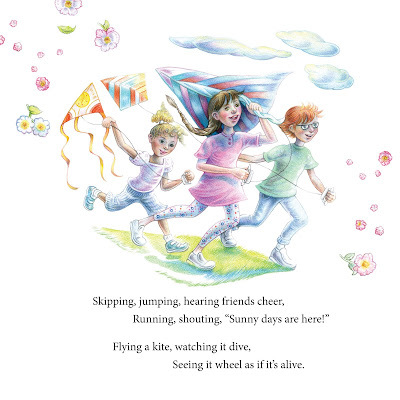 This is the last illustration in the book. I'll give you one guess how the book ends! Please leave me a comment by December 6 and I'll enter your name in the giveaway. Bridgett will be happy to provide an autographed copy for one fortunate winner. This will make a great holiday present for a young reader. Don't forget to leave me your email address if you are new to my blog. Congratulations to Elena Caravela who won eight audio books from last weeks blog. 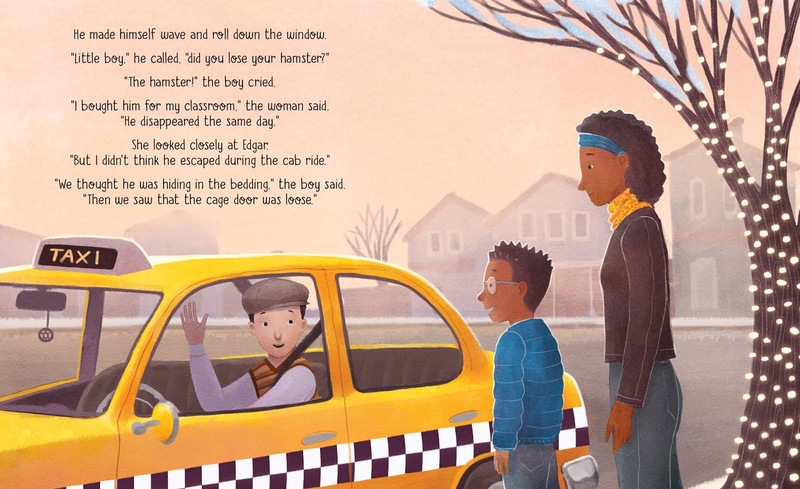 Edgar, the cab driver, had a problem. Ohhhf! Something scrambled onto his chest. Ayyee! Something hard brushed his face. No! It was a hamster! Edgar tried to think who might have left a hamster in his cab, but couldn't think of anyone. 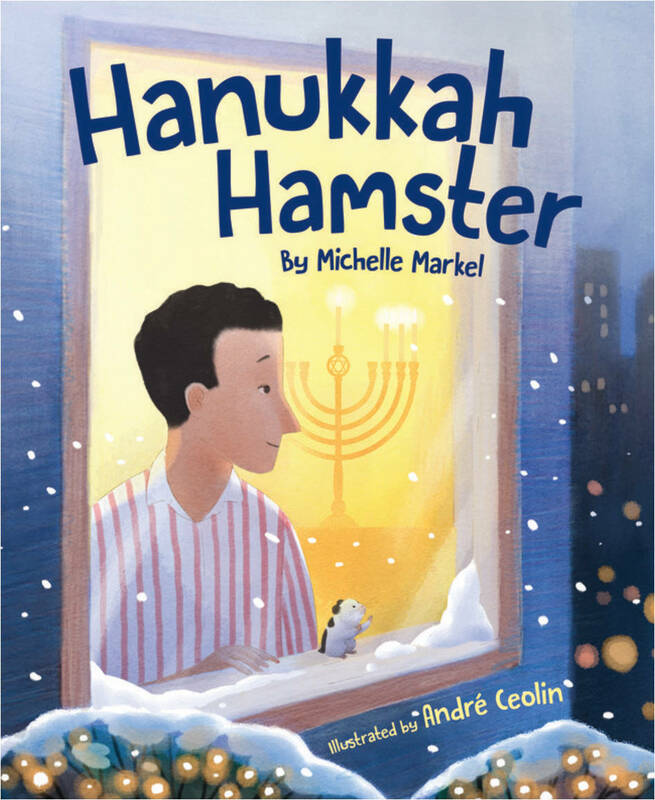 He brought the hamster home, made a bed for him, and lit his Hanukkah menorah. Throughout the celebration of Hanukkah, Edgar sends pictures of the hamster back to his family in Israel and searches for Chickpea's owner. Finally, on the eighth day Edgar drives to the outskirts of town where he recognizes a woman and her son. After Edgar shows them the pictures of Chickpea on his phone, the three realize that he is the hamster the woman bought for her classroom. 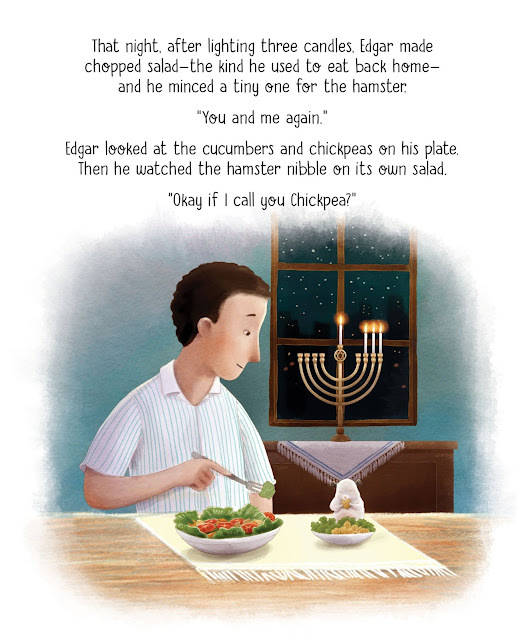 The teacher understands that Edgar is far away from his Israeli family and decides to give the hamster to Edgar saying, "He looks right at home." 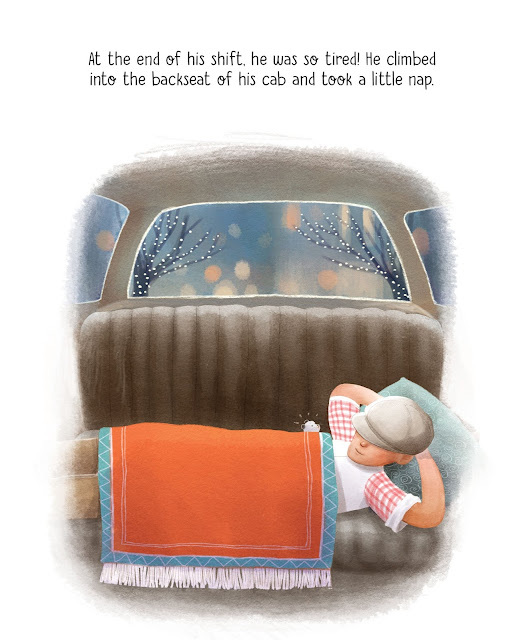 That is a sweet ending to a heart-warming story written by Michelle Markel, illustrated by Andre' Colin, and published by Sleeping Bear Press. Hanukkah Hamster will make a lovely present for a young reader on your holiday list. Leave me a comment by November 29th and I'll enter your name in the giveaway. Make sure you leave me your email address if you are new to my blog. 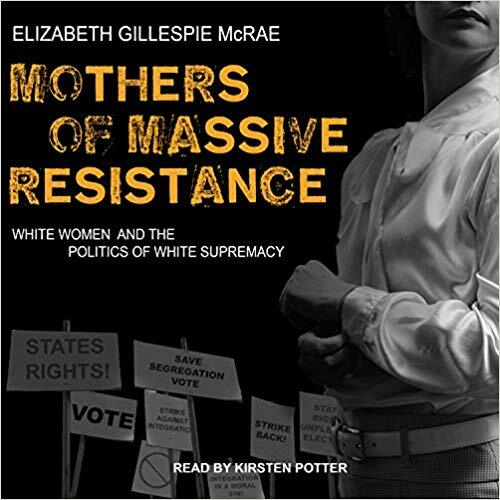 Congratulations to Joyce Hostetter who won Mothers of Massive Resistance from last week's blog. As I've done previously, this week I'm joining the blog tour sponsored by the Audio Publishers Association. Details for this HUGE audio book giveaway are below. Since you've have heard my reasons for listening to audio books, I decided to ask my Facebook friends for their reasons. 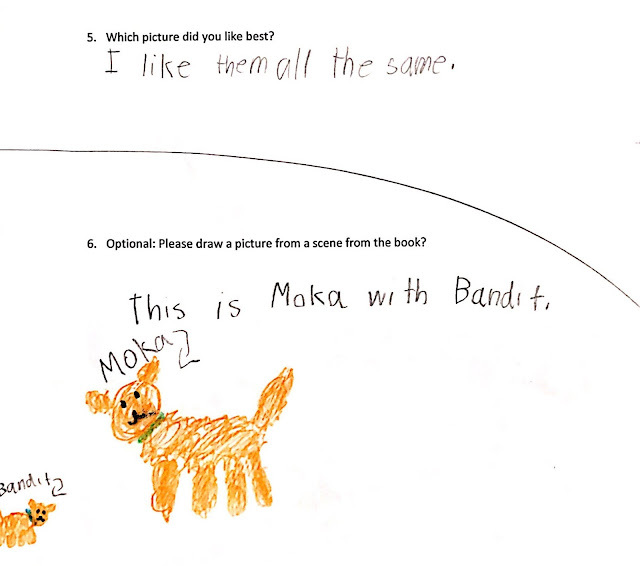 Out of the twenty-one people who answered, only two hesitated to give audio books a full thumbs up. 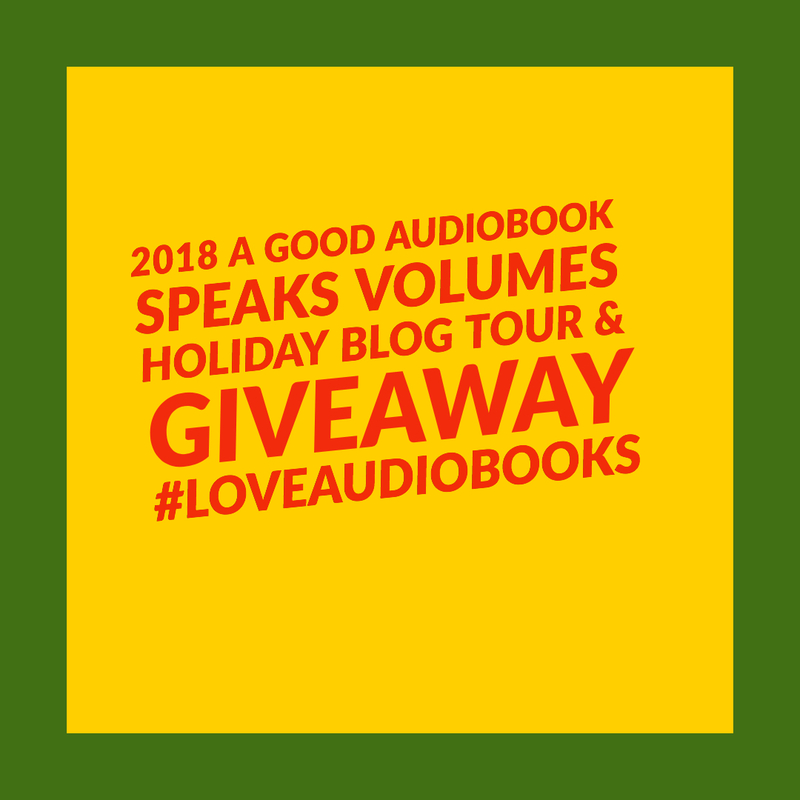 The three most common positive reasons were that audio books helped pass the time on car trips, while exercising or walking, or doing household chores. I'm giving the less than totally positive responses first, since other responders kindly answered these concerns. I'm also sharing some of the more novel reasons why my Facebook friends like audio books. Teresa F: "Once when we were deep in traffic on Hwy 13 in Delaware, my husband turned on the tape Congo. He liked the movie and wanted to see if the book tracked. Well, the car was quiet, the girls were interested and the narrator started. We were about ten minutes in when something big happens. I forgot what it was, but it was a shocker and I almost drove off the road and into another car! My husband turned it off and that was it. We listen to old Time Radio now. Maybe it was too intense of a story…But I may find out that I’m better than that now!" Melody S: "I’m on the fence about audio books. It’s great to catch up on the latest while you’re stuck in traffic, waiting for an appointment, etc. But my mind often wanders without a focal point which means I have to retrace my steps (so to speak) more often than not." Elena C. "I listen while I paint." Mare B: "I love audio books because I get to listen to someone express the text with emotion. I love listening to them as I fall asleep." Debbie A: "It helps me shape my craft by listening to published authors and hear what editors decided to publish." Sarah A: "If I’m sitting and relaxing, I need the actual book, as long as my hands are active, I can listen and focus on the audiobook. The moment I sit still, my brain starts to wander. My 7-year-old son likes to listen to audio books and read along in the actual book." Sandra W: "Audio books help me, a writer, to HEAR the difference between a well-crafted novel and one that is not so well done. It’s a great way to hear repeat words that work those that are annoying and the subtle ways an author draws you into setting or leaves you wondering. It helps to hear better ways to do attributions and catch the rhythm of the words in sentences and paragraphs…Listening to books on CD or on your phone is the next best thing to reading your own work out loud!" Carrie S: "My kids and I enjoy listening to books in the car. 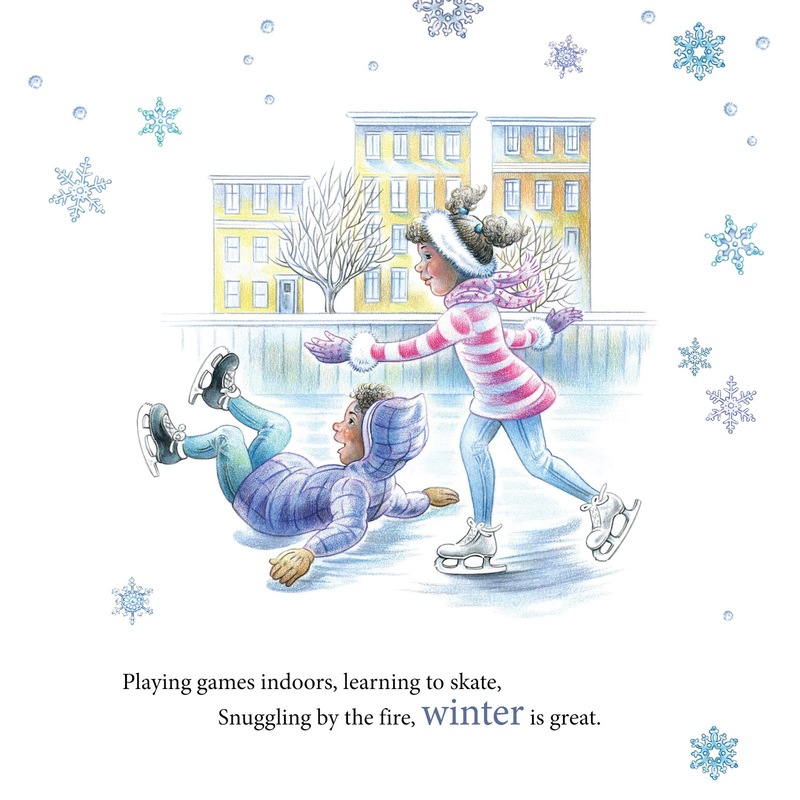 It equals the playing field with the book level for my 3 and 11-year-old and we are all a captive audience." Janet B: "My husband is a non-reader. I soon found, however, that he loves audio books as much as I do! We usually choose mysteries and thrillers, with an occasional historical thrown in. After our daughter moved seven hours away, we found we could just about finish a book on a round trip visit to her. We also have to drive over half an hour from our home in the country to the town where we do everything--doctors, groceries, eating out, etc. So for us, those trips provide a serial listening experience like I suppose the old time radio programs did. We have been known to pull into our garage and sit there listening for fifteen minutes or more when we happen to be at the end of an intense story." Faith K: "We listen to novels, biographies, histories, theology, poetry, essays, lectures and short stories as part of our homeschooling and for pleasure. We have used Librivox, ITunes, Audible, and CDs from the library. My husband I listen and discuss books as we listen. A good narrator makes all the difference for listening without the mind wandering, but if the book is really good, then even a poor narrator can’t ruin it. The best narrator I’ve listened to recently is Sissy Spacek’s reading of To Kill a Mockingbird. The worst reader was Ray Bradbury reading his own Fahrenheit 451. But I still finished listening to it!" Kathleen B: When I’m in pain and can’t focus to read a book, I find audio books to be very comforting. Especially on nights when pain wakes me up. Susan R: My mom used to be an avid reader but has severe macular degeneration now. She doesn’t use CD's but gets books on tape from the Association for the Blind. So not quite the same as what you were asking but it has definitely brought her a lot of happiness and helps fill her time. Myra D: "I’ve been diagnosed with Graves disease and my vision is off. Audio books are necessary if I wish to read. But we’ve had them for trips about 20 or more years. Helped lots when girls were squabbling in backseat. LOL." Jo Lynn W. "When I went back to school I listened to audio books when I was commuting to Northern Illinois University (2 hours round trip). It was a great time to unwind. 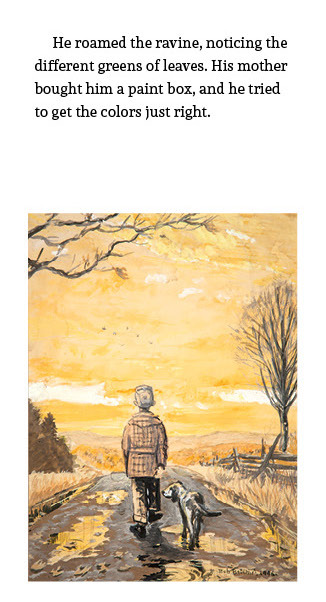 I remember Anne of Green Gables fondly." Melinda L. "It’s entertaining, and the actors who read the books bring life to the characters to enhance the author’s work. So much fun! Try the Amelia Peabody books by Elizabeth Peters for a real treat." Judy M. "We like to listen to audio books when doing long repetitive jobs like working in our greenhouses. It frees our hands and eyes to multitask. When I read to myself, I tend to skim and hurry. Listening to a book read aloud slows me down and allows me to savor a story. A skilled reader turns a book into theater for your ears. Pet peeve is when they cut a six-hour book down to 1.5 in an abridged version-- especially if it's one I read myself and really enjoyed. Why do you listen to audio books? Leave me a comment and I'll enter your name for this contest and use your name for my next audio blog tour and enter you for that too! Here are the eight titles that will be available to you if random.org picks your name on November 22. If you are chosen, you will be provided with a promo code from Libro.fm to download the books. Please leave me your email address if you are new to my blog. Limited to US addresses only. Giveaway ends November 22. 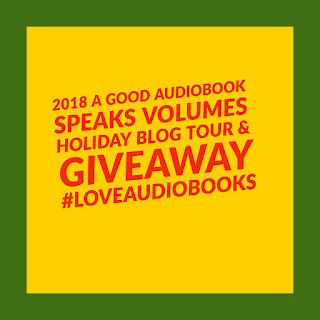 Do you want more chances to win these audio books? Then check out this list of bloggers and enter through their blogs. If you are a writer, check out this post on Writer Unboxed on Writing for Audiobook. Congratulations to Connie Saunders who won Memphis, Martin, and the Mountaintop from last week's blog. When I read the blurb about MOTHERS OF MASSIVE RESISTANCE: White Women and the Politics of White Supremacy (Oxford University Press, 2018) in the Tantor Audio catalogue, I thought it might provide a different perspective on the Jim Crow era. It definitely did. Mississippi columnist Florence Sillers Ogden. Since I am unable to summarize twelve hours of listening, I will share some facts that resonated with me. In Bear Mountain, Virginia from the 40's - 90's light-skinned blacks (and possibly some native Americans) paid a lot of money to purchase "white" birth certificates. Changed birth certificates allowed children to attend the better, all-white schools. Monacan Native Americans were forced to identify as black. 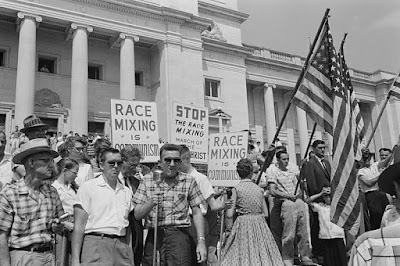 White bus drivers, teachers, and voter registrars were often the people who determined a person's race and generally upheld Jim Crow and the one-drop rule. See this article on Walter Plecker. Mildred Lewis Rutherford (1851-1928) was a pro-confederate daughter of a Georgia plantation owner who paved the way for pro-segregationists white women. As the historian general of the Daughters of the American Confederacy, she believed that whites were superior, state governments should dominate schools and social welfare and textbooks should be censored. McRae said she "single-handedly reinvented the South." Women's suffrage in the South gave a platform to support Jim Crow. McRae described Florence Ogden as a "subversive columnist." Besides being anti-integration she also supported anti-immigration legislation. Cornelia Tucker's efforts in Charleston, SC led to the rise of Republicans in South Carolina and Eisenhower winning the vote in 1954. She was against European refugees and wanted blacks purged from the Republican party. 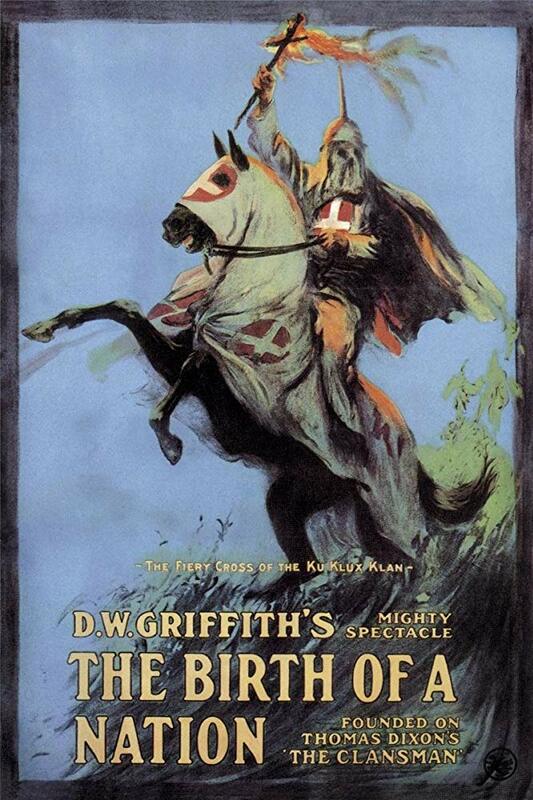 Nell Lewis, the first female reporter for the Raleigh News and Observer, considered The Birth of a Nation the best film ever. At the same time that she wanted to end child labor, promote mental health reform, abolish capital punishment, she was also against labor unions since she believed they were pro-Communist. McRae writes that Lewis's stories upheld white supremacy as white women were the "guardians" of racial segregation. White women were angry with Eleanor Roosevelt for eating with blacks in North Carolina. During WWII, segregationists feared white women working with black laborers. They wanted to protect workplaces for returning white soldiers. Cornelia Tucker linked Communism with civil rights. Her battlefield was school textbooks. 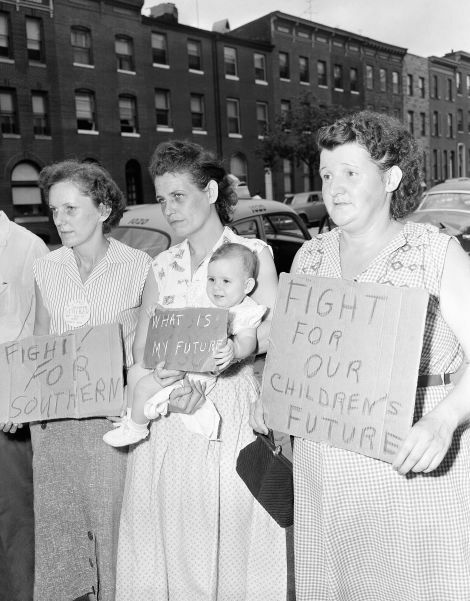 Many southern women defended segregation as what "God began and wanted." They appealed to women's maternal duty to protect their children from mongrelization; there was a pervasive fear of miscegenation. Many white southern women feared progressive education that included curriculum which studied other nations. Members of the DAR condemned the United Nations. After the Brown decision in 1954, black parents feared sending their children into white schools that were hostile to their children. They lived with fear, uncertainty, and hope. In 1956, following the Brown vs. Board of Education decision, North Carolina "patriots" wrote to black families asking them to reconsider going to white schools. When Emmett Tillett was murdered, one of the women (I believe it was either Nelle Lewis or Florence Ogden) wrote, "There is no outcry. It must not have happened." Calling upon their duty as mothers, segregationist women thought white schools would prevent interracial marriage and maintain white supremacy. They feared federal court decisions which would challenge their private lives. They blamed the Jews, communists, socialists, and NAACP for integration attempts. In North Carolina alone, there were 28,000 people who signed petitions against the Brown vs. Board of Education decision. In Little Rock, AK closing Central High in 1958 was the white women's victory to mobilize their children and preserve white schools. In Virginia and North Carolina "school choice" was a way to avoid integration. September 2, 1970, protest at Charlotte-Mecklenburg Public School headquarters. 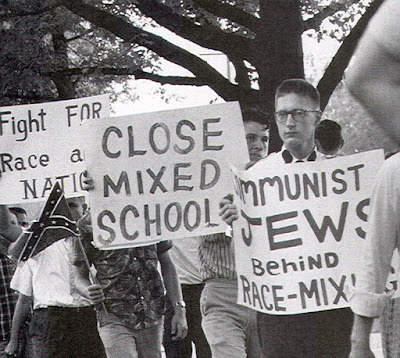 White students adopted the 'freedom of choice' language that segregationists had invoked since the Brown decision. 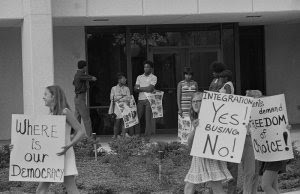 While black youth in the NAACP watched as white students pledged support for integration but not for the busing that would accomplish it. Courtesy of the Charlotte Observer and the Robinson-Spangler Carolina Room, Public Library of Charlotte and Mecklenburg County. 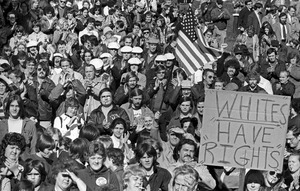 In the mid-1970's Boston mothers who were opposed to busing, looked to southern women for direction. The bus, not the children became central. Complex class politics, working class concerns, and maintaining property rights were central in protecting white privilege for these "true American women." Here is an audio snippet narrated by Kristen Potter. Ms. Potter does an excellent job articulating the book and using a southern, genteel voice as appropriate. Click below for an interview with the author. I am giving away my copy of this audio book. Please leave me a comment by November 15. Share it on social media or become a new follower of my blog and tell me what you have done, and I'll enter your name twice.